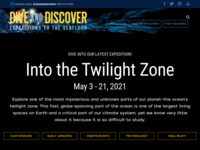 Dive and Discover is an interactive distance learning web site designed to immerse you in the excitement of discovery and exploration of the deep seafloor. Dive and Discover brings you right on board a series of research cruises to the Pacific and Indian Oceans, and gives you access to the latest oceanographic and deep submergence research as it happens! Be at the front line of scientific inquiry and join scientists including geologists, geophysicists, chemists and biologists who are exploring the seafloor and making amazing deep-sea discoveries. Daily updates, photos, videos, and e-mail correspondence with scientists aboard research vessels allow you to follow the progress of the scientific mission and find out about life on the floating laboratories at sea. The site provides links to web pages discussing each of the Dive and Discover expedition sites, deeper discovery based on specific seafloor expedition topics, a teacher�s page, and further Dive and Discover information.